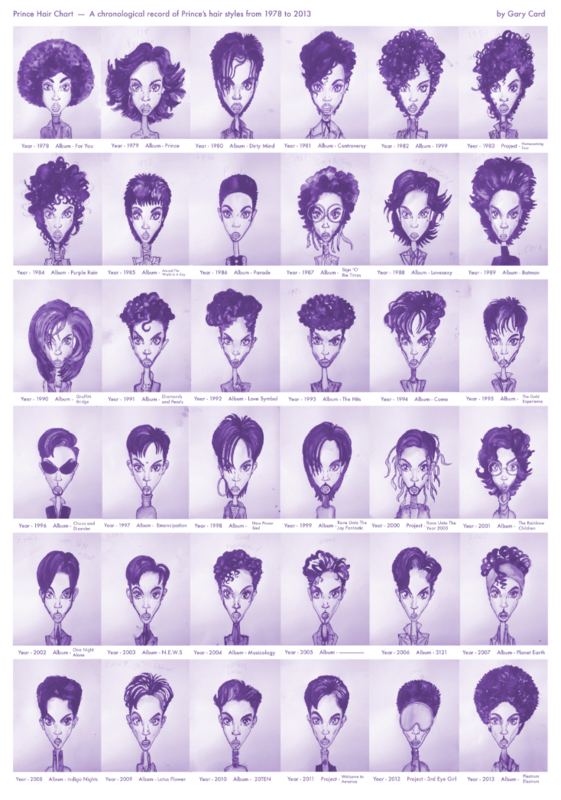 Prince hairstyles: Every hairdo from 1978 to 2013, in one illustrated chart and GIF by Gary Card. Over the course of his 35-plus years in music, Prince has found a lot of ways to be funky. Case in point: His hair, which he’s changed just as often as his sound and even more often than he’s changed his name. To illustrate the evolution of His Royal Purpleness’ hairdo, illustrator and set designer Gary Card whipped up this chart for The Beat, which we’re reprinting with Card’s permission below. (Click to view a larger version.) 2013 may have found Prince coming full circle, but if this chart is any indication, he won’t be sticking with his current look for long.